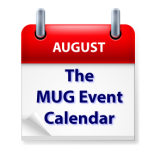 Another week on The MUG Event Calendar shows many groups on summer break, but some are forging ahead. Christian Pickman of Micromat will be the guest at a California Apple group, Michael Krulik of Avid will present to a California creative pro group, and futurist Allison Druin will talk to a group in northern Virginia. Other topics for the week including Mac networking, Preview, Apple Music and more. Wednesday 19-Aug Los Angeles Creative Pro User Group – Michael Krulik from Avid who will show off the latest version of Media Composer.